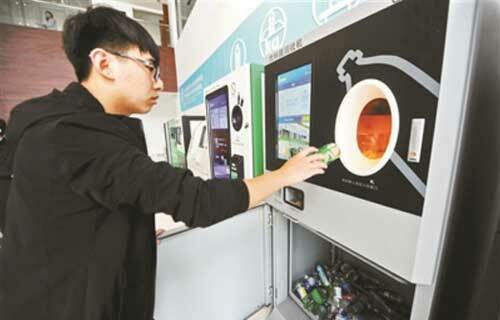 The plant, at the Beijing Incom Resources Recovery Recycling Co., used to recycle polyester from plastic bottles, which was then processed into new drink bottles. The company was able to treat about 2.2 billion bottles annually, but short of supplies of discarded plastic bottles resulted in the plant’s closure in 2013. Most of Beijing’s garbage, estimated to be seven million tons in 2014 alone, ended up in one of 82 garbage collection points outside the Fourth Ring Roads, which then sent the garbage to various illegal garbage treatment mills in Hebei and Henan provinces for processing.It launched 5,000 waste-bottle recycling containers, but got less than 1 percent of all waste bottles in Beijing. “We had no rivals in this industry, nor were we able to collect enough garbage to feed our capacity,” Chang Tao, head of Incom, told Beijing Youth Daily. Chang said the plant was able to treat five tons of plastic bottles, or about 2.2 billion bottles, but received just one to two tons, or a little more than 800 million bottles, for treatment annually, which was out of proportion to the rapid increase in the city’s garbage. “We were never able to compete with those ‘black mills,’” which Chang said hardly spent any money on environmental protection – such as proper cleaning of the bottles and sewage treatment – during the process of treating the discarded bottles. As a result, the prices they offered for garbage were much higher than Incom’s. Because the company was operating at a daily loss of more than 100,000 yuan ($14,773), it had to close the facility in 2013, Chang explained. Beijing is now rectifying the industry, and 80 of the 82 garbage collection sites have been closed. Illegal mills in nearby Hebei province are also being shut down.